Thailand's public health ministry advised residents to avoid outdoor activities as the health crisis continues to escalate. Asawin Kwanmuang, the city's governor, accepted that drones were not a long term solution to Bangkok's pollution levels but invited academics and private sector workers to contribute ideas to end the crisis. "Those who are knowledgeable on this issue, don't give opinions to others, tell me. I am the one who is working on the issue, please give me advice," he said. "Do I know everything? No, I don't," the politician said. "Because I do not know everything, that's why I will hold a meeting. Please join us in brainstorming." The governor has declared the city a "pollution control zone", enforcing road closures and limits on outdoor burning, construction and diesel exhaust. The proposed measures tackle the perceived causes of Bangkok's pollution, particularly in the form of vehicle emissions. 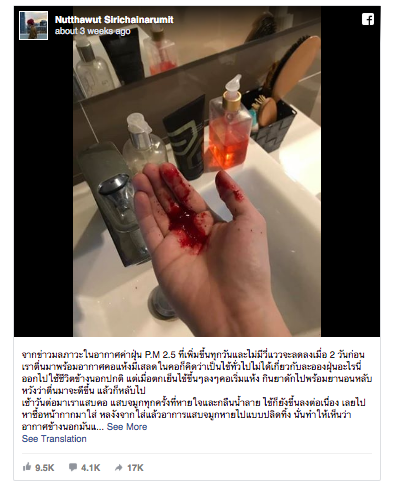 Some Bangkok residents took to social media to share photographs of the pollution's apparent physical impact. “I was totally shocked because I never sneezed blood before in my entire life," he wrote on Facebook. Thailand's prime minister, Prayuth Chan-ocha, ordered inspections of factories to measure how much pollution they were emitting.